The plastid is a semiautonomous organelle with its own genome. Plastid genomes have been widely used as models for studying phylogeny, speciation and adaptive evolution. However, most studies focus on comparisons of plastid genome evolution at high taxonomic levels, and comparative studies of the process of plastome evolution at the infrageneric or intraspecific level remain elusive. Holcoglossum is a small genus of Orchidaceae, consisting of approximately 20 species of recent radiation. This made it an ideal group to explore the plastome mutation mode at the infrageneric or intraspecific level. In this paper, we reported 15 complete plastid genomes from 12 species of Holcoglossum and 1 species of Vanda. The plastid genomes of Holcoglossum have a total length range between 145 kb and 148 kb, encoding a set of 102 genes. The whole set of ndh-gene families in Holcoglossum have been truncated or pseudogenized. Hairpin inversion in the coding region of the plastid gene ycf2 has been found. Using a comprehensive comparative plastome analysis, we found that all the indels between different individuals of the same species resulted from the copy number variation of the short repeat sequence, which may be caused by replication slippage. Annotation of tandem repeats shows that the variation introduced by tandem repeats is widespread in plastid genomes. The hairpin inversion found in the plastid gene ycf2 occurred randomly in the Orchidaceae. The plastid is a semiautonomous organelle that evolved from cyanobacteria by endosymbiosis . During the course of evolution, the coding capacity of plastid genomes (plastomes) has experienced drastic reductive evolution with gene loss or transfer to the nucleus [2–4]. The genes reserved in plastomes are usually necessary for the chloroplast to perform its normal functions, including approximately 80 unique protein-coding genes, 30 tRNA genes and 4 rRNA genes. In addition to highly conserved gene content, the organization of the plastome in higher plants is remarkably conserved, which is characterized by two large inverted repeat regions (IRA and IRB) separated by two single copy regions with different lengths, known as a large single copy region (LSC) and a small single copy region (SSC) [3, 5–7]. Benefiting from the advances in next-generation sequencing, more plastid genomes have been sequenced, and there are more than 2800 records of eukaryotic plastid genomes available in the NCBI database (https://www.ncbi.nlm.nih.gov/genomes/GenomesGroup.cgi?opt=plastid&taxid=2759 last accessed May 30, 2018). Due to their frequent sequencing and wide availability, plastid genomes have been used as models in genetic variation studies, encompassing both micro- and macro-evolutionary events across all lineages of plants [8–14]. However, previous studies have mostly focused on comparisons of plastid genome evolution at higher taxonomic levels (e.g., across genera or families or orders) or between autotrophic and heterotrophic plants, which may have phylogenetic sampling ‘gaps’ or evolutionary route ‘gaps’ . This may cause key steps in the process of plastome evolution at the infrageneric or intraspecific level to remain elusive. The genus Holcoglossum Schltr. (Vandeae, Orchidaceae) consists of approximately 20 species that are mainly distributed in southwestern China and neighbouring regions [16–24]. Holcoglossum has two diversity centres, one in the tropical region and the other in the temperate alpine region of the Hengduan Mountains (HDM), with an elevation of over 2000 m [20, 23, 25]. At least six species of Holcoglossum are distributed in the HDM, five of which are restricted to this area . Biogeographic analyses and molecular phylogeny suggest that Holcoglossum dispersed from tropical regions to the HDM and then radiated there . Previous results indicated that the pendent growing pattern  and laterocytic and polarcytic stomata are perhaps ecological adaptations to the strong winds and ample rains in the alpine region of the HDM . Rapid changes in temperature and weather conditions are major challenges for the species living in temperate alpine regions in the HDM. Previous results indicated that plastid genes of Cardamine resedifolia (Brassicaceae) experienced more intense positive selection than those of the low altitude C. impatiens, possibly as a consequence of adaptation to high altitude environments . Here, using comparative plastid genomes of 15 complete plastome sequences of 12 species of Holcoglossum and 1 species of Vanda, we aim to (1) understand the evolution of the plastid genome in Holcoglossum and (2) investigate the evolutionary pattern of the plastid genome at infrageneric and intraspecific levels. In this study, we sampled and sequenced 12 species of Holcoglossum, including 2 individuals of H. flavescens and H. nujiangense, and 1 species of Vanda. Two plastomes of Neofinetia were downloaded from NCBI (Table 1) as outgroups. Fresh leaves, stems and flowers were collected in the field and preserved in silica gel as well as frozen at − 20 °C. Total DNA was isolated using a modified cetyltrimethyl ammonium bromide (CTAB) protocol . DNA with concentrations greater than 100 ng/ml was sheared to 500 bp using Covaris M220. Sequencing libraries were prepared using the NEBNext Ultra DNA Library Prep Kit (according to the manufacturer’s protocol) for subsequent paired-end sequencing on an Illumina HiSeq 2500 at the Institute of Botany, Chinese Academy of Sciences. Plastome assembly and annotation followed the methods of Feng et al. (2016) . In short, raw reads were trimmed and filtered with NGSQCTOOLKIT v 2.3.3 , and bases with a PHRED quality lower than 20 were trimmed. All trimmed reads shorter than 70 bp were discarded. The filtered reads were mapped to the plastome of Calanthe triplicata (https://www.ncbi.nlm.nih.gov/nuccore/NC_024544.1) in Geneious v10.2.2 (http://www.geneious.com, last accessed June 4, 2017) to filter reads matching the reference genomes. De novo assemblies were constructed in VELVET  with several K-mer values, and contigs from each assembly were merged in Geneious and combined into scaffolds using the default parameters (minimum overlap 20 bp, minimum similarity 70%). Alternatively, contigs from both assemblies (Geneious or Velvet) were merged in SSPACE  to form scaffolds/draft genomes. IR boundaries for each draft plastome were confirmed by BLAST , with the first and last sequences (approximately 50 bp) of the draft plastome used as search terms. The finished plastomes were annotated by using DOGMA with an e value of 5% and identity thresholds of 60 and 80% for protein-coding genes and tRNAs, respectively . Smaller exons (< 30 bp) were manually annotated by local BLAST in Geneious. The initiation codon, termination codon, and other annotation errors for each gene were revised in Sequin and exported as GenBank files. We generated multiple sequence alignments of whole plastid genomes using MAFFT under the automatic model selection option with some manual adjustments . 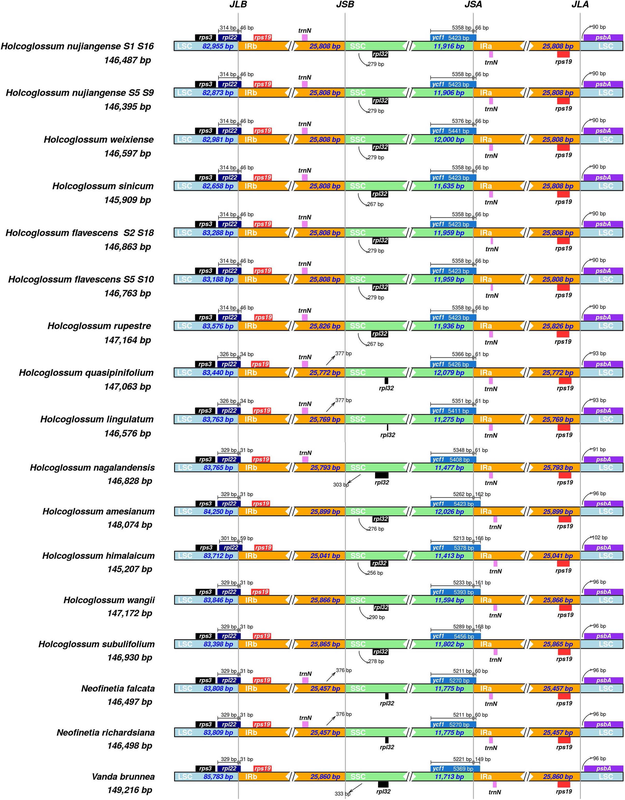 At the same time, 68 protein-coding sequences were exported from plastomes in Geneious. The protein-coding sequences were aligned at the codon level with the option “-codon” using MUSCLE  in MEGA v7.0.2 . Stop codons were removed from the sequences prior to alignment. The phylogenetic trees were reconstructed based on the nucleotide data of whole plastid genomes with the GTRGAMMA model using RAxML v8.0.9  in the CIPRES Science Gateway , and branch support was assessed using 1000 standard bootstrap replicates. We compared the overall similarities among different plastomes in Holcoglossum using H. subulifolium with one IR region removed as a reference. The sequence identity of the Holcoglossum plastid genomes was plotted using the mVISTA program with the LAGAN mode . To screen variable characters within Holcoglossum, the average number of nucleotide differences (K) and total number of mutations (Eta) were determined to analyse nucleotide diversity (Pi) using DnaSP v6.10.04 . The step size was set to 200 bp, with a 500 bp window length. The complete plastomes of two H. flavescens individuals and two H. nujiangense individuals were aligned in Geneious with the MAFFT algorithm, and differences were identified by using the “Find Variations/SNPs” function and checked individually. We recorded substitutions and indels separately, as well as their location in the chloroplast genome. Since all of the indels in intraspecific variation are caused by the copy number variation of the short repeat sequence, as shown in our results, we further explored whether the tandem repeat also contributed to interspecific plastid genome variation. We located and annotated the tandem repeats on the multiple sequence alignment matrix of Holcoglossum plastome with Phobos  in Geneious. To explore the selection patterns and identify positive selection on the protein-coding genes, we use two models, model M0 and a branch-site model, implemented in the PAML Codeml program . The codon frequencies were determined by the F3 × 4 model. Twenty-eight genes with too few variable sites were not examined (Additional file 1: Table S2). Alignment gaps and uncertainties were deleted to avoid false positives . The model M0 (model = 0, Nsites = 0, which assumes no site-wise or branch-wise dN/dS variation) estimates the rates of synonymous (dS) and non-synonymous substitutions (dN) and the dN/dS value of each gene, which can be an indication of the selection pattern. The branch-site model (model = 2, Nsites = 2, fixed omega = 0, omega = 2) was used to detect evidence of positive selection on specific sites along a specific lineage. The goal of our study was to explore the role of positive selection in the adaptive patterns of Holcoglossum adapted to tropical regions and temperate alpine regions; thus, the tropical clade and alpine clade were used to perform the selection analyses. The likelihood ratio test (LRT) with a χ2 distribution was used to determine which models were significantly different from the null model (model = 2, Nsites = 2, fixed omega = 1, omega = 1) at a threshold of P < 0.05. The Bayes empirical Bayes (BEB) method was used to statistically identify sites under positive selection with posterior probabilities ≥0.95 . In the present study, 14 complete plastomes of 12 species of Holcoglossum and 1 species of Vanda were obtained for the first time. These plastomes showed the typical quadripartite structure of most angiosperms. The plastomes of Holcoglossum had a total length range between 145,207 bp in H. himalaicum and 148,074 bp in H. amesianum. The length variation of the Holcoglossum plastomes observed here was low (145–148 kb). The expansion and contraction of the inverted repeat regions usually contribute to variation in the length of plastomes. In this study, we found that the IR/SSC boundary was located differently among the 12 Holcoglossum species, but the location of the boundary and length of the IR regions only showed moderate variation (Table 1), and there was no obvious phylogenetic implication of extension/contraction of IRs among the Holcoglossum plastomes (Fig. 1). All of the sequenced Holcoglossum plastomes are highly conserved in structure compared to most angiosperms, sharing the common typical quadripartite structure comprising two copies of IR (25,041–25,899 bp) separated by the LSC (82,658–84,250 bp) and SSC (11,275–12,079 bp) regions (Table 1). The overall GC content was between 35.3–35.5% (Table 1), which is similar to the other Orchidaceae plastomes sequenced thus far [44, 45]. The Holcoglossum plastomes encoded an identical set of 102 genes, of which 85 were unique and 17 were duplicated in the IR regions. The 102 genes contained 68 protein-coding genes, 30 tRNA genes, and 4 rRNA genes (Additional file 2: Table S1). Functional cp-ndh genes have been lost or pseudogenized in all Holcoglossum species. Phylogenetic analyses indicated that Holcoglossum is monophyletic and subdivided into three strongly supported clades (ML bootstrap =100%): the tropical clade (TC) with five species, the alpine clade (AC) with five species and the HC clade with two species (Additional file 3: Figure S1). All of the nodes among the lineages in our tree were strongly supported by ML bootstrap values ≥94% (Additional file 3: Figure S1). Our results indicated that H. amesianum and H. naglandensis are sister groups forming a sister clade to H. himalaicum and H. wangii. Comparing plastomes of two individuals of H. flavescens, we found 17 SNPs, 1 single nucleotide indel and 3 multi-nucleotide indels ranging from 14 to 57 bp in H. flavescens. 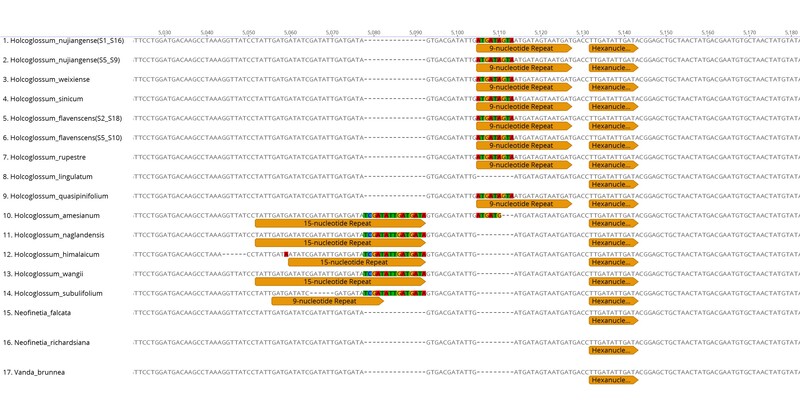 Between the two individuals of H. nujiangense, 8 SNPs, 3 single nucleotide indels and 5 multi-nucleotide indels of 3–36 bp length have been found (Table 2). All of the SNPs and indels are located in the LSC and SSC regions, and all of the indels contributing to intraspecific variation are caused by the copy number variation of short repeat sequences. The border regions of LSC/IRB, IRB/SSC, SSC/IRA, and IRA/LSC are usually highly variable even between closely related species [46, 47]. Therefore, we compared and visualized the exact IR border positions and their adjacent genes among the Holcoglossum chloroplast genomes and the reference genome using the IRscope online program . The results showed that the genes trnN-rpl32-ycf1 and rpl22-rps19-psbA were located in the junctions of the SSC/IR and LSC/IR regions. The ycf1 gene spans the SSC/IRA region and extends to the IR region from 61 to 168 bp (Fig. 1). The mVISTA percent identity plot and slide window analysis show that the most divergent regions are located in the trnS-trnG, trnE-trnT, trnL-trnV, clpP-psbB and psaC-rps15 regions in the Holcoglossum plastome (Figs. 2 and 3). Most of the plastid genes in Holcoglossum are under strongly negative selection with a very low ω value (ω < 0.5), yet the genes ycf2 and ycf1 of uncertain function are under neutral selection with a ω value near to 1.0; the only gene found under positive selection is psbK with a high ω value (ω = 1.92088) (Additional file 1: Table S2). The branch-site model analysis does not detect any site under positive selection when the alpine clade is set as the foreground branch, while there are 14 sites in ycf2 and 2 sites in the ycf1 gene have been detected theoretically under positive selection (as the Bayes Empirical Bayes probability > 0.95) when the tropical clade is set as the foreground branch (Additional file 4: Table S3). The phylogenetic relationships among the major lineages of Holcoglossum based on plastomes were essentially in agreement with the results of Xiang et al. based on four markers (matK, trnH-psbA, trnL-F, and nuclear ITS sequences) with the exception of the placement of H. amesianum. Our results indicated that H. amesianum and H. naglandensis are sister groups forming a sister clade with H. himalaicum and H. wangii. However, H. amesianum had been placed in a sister clade to the clade formed by H. naglandensis, H. himalaicum and H. wangii but with low support (PP = 0.78, BS < 50) in previous results . The difference may be due to the different taxonomic sampling in the two studies or the markers used in the previous study being unable to resolve the phylogenetic relationships in Holcoglossum. The plastid gene ycf2 is a large yet functionally undefined ORF in land plants. Nucleotide sequence similarity among land plant ycf2 is extraordinarily low compared to other plastid-encoded genes, being less than 50% across bryophytes, ferns, and seed plants . 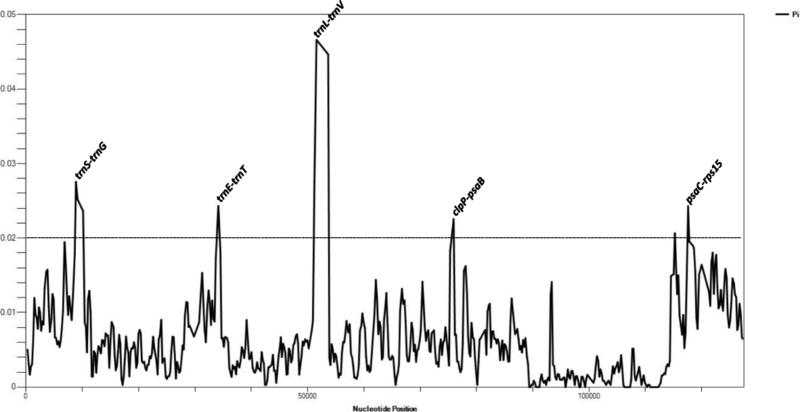 When we aligned the protein coding gene ycf2 of Holcoglossum, we found a short inversion mediated by a 17 bp inverted repeat sequence located down- and up-stream in H. flavescens, H. quasipinifolium, H. amesianum and H. naglandensis (Additional file 5: Figure S2). To understand whether this inversion occurred randomly, we analysed it across the Orchidaceae family. We found that this motif is conserved at the sequence level in Orchidaceae but is inversely randomly mediated by the hairpin structure. In some species, this motif has been lost or disrupted (Additional file 6: Figure S3). Previous studies show that most stem-loop structures involving small inversions occur in close proximity to the stop codons of genes and have the function of stabilizing the corresponding mRNA molecules , and the majority of the small inversions were located downstream of adjacent genes with a tail-to-tail orientation . However, the hairpin inversion in the plastid gene ycf2 found in this study is located in the coding region, occurring randomly and being disrupted in some species. These results indicated that this motif may not be pivotal for ycf2 to exercise its function, and this needs to be revised with a broader sample. Most of the SNPs found between the two different individuals of Holcoglossum are located in intergenic regions. We found 5 SNPs located in the coding region of psbA, rpoC2, accD, rpl20 and ycf1 in H. flavescens, among which the SNPs located in rpoC2 and accD lead to a nonsynonymous mutation between these two individuals. In H. nujiangense, we found 1 synonymous mutation SNP in rpoC2, 2 nonsynonymous mutation SNPs in rpoC1, and 1 nonsynonymous mutation SNP in ycf1. Interestingly, all of these intraspecific variation sites in coding regions are usually conserved between species. 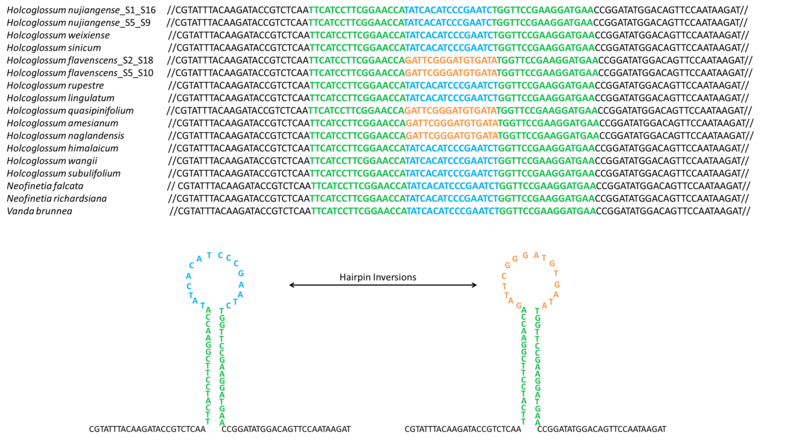 All 3 indels found in H. flavescens are located in the intergenic region (1 in trnL-trnF, 2 in trnF-trnV); the 5 indels found in H. nujiangense are located in the intron region of trnK, the intergenic region of rpoB-trnC, trnT-psbD, trnF-trnV and ccsA-psaC. Comparative analysis found that all indels are caused by the copy number variation of the short repeat sequence, which may be caused by replication slippage (Additional file 7: Figure S4). This is in line with a previous study that found that the intraspecific variation in the chloroplast genome of Astragalus membranaceus was due to an extra copy of the “TATATATTTA” repeat , and the vast majority of mutations in the spontaneous plastome mutants of Oenothera are indels originating from DNA replication slippage events . Furthermore, the location of intraspecific variation loci shows that most variations in these two species are species-specific except for the variation in the mutation hotspot region trnL-trnV. These intraspecific loci represent potential markers that can be used to distinguish closely related varieties of specific taxa. However, further population genetic studies are still needed to determine whether intraspecific genetic diversity is linked to geographic ranges or the intrinsic characteristics of the taxonomic group. DNA tandem repeats (TRs) are not just popular molecular markers but are also important genomic elements from an evolutionary and functional perspective [53–56]. Because all the indels found in intraspecific variation are caused by the copy number variation of the short repeat sequence, as shown in our results, we further explored whether the tandem repeat also contributed to interspecific plastid genome variation. We located and annotated the tandem repeats on the multiple sequence alignment matrix of the Holcoglossum plastome with Phobos  in Geneious. Our results indicated that the mutation hotspot regions are always accompanied by densely distributed tandem repeats (Additional file 8: Figure S5), which indicates that the tandem repeat sequences play an important role in plastid genome variation between closely related species. This finding is consistent with the observation that nearly all detected mutations in the spontaneous plastome mutants of Oenothera could be associated with repetitive elements . Furthermore, we found that in the plastid gene ycf2, a 15 bp extra copy of “TCGATATTGATGATA” is synapomorphic for the TC clade, whereas the possession of the 9 bp duplication of “ATGATAGTA” is synapomorphic for the HC plus AC clade, with a reversal (secondary loss) in H. lingulatum (Additional file 9: Figure S6). Therefore, the HC clade can be referred to as the “intermediate clade” as suggested by Xiang et al. . However, whether these repeat regions have contributed to the adaption to different habitats (here referring to tropical and temperate alpine regions) remains to be verified. Understanding the patterns of divergence and adaptation among the members of a specific phylogenetic clade can offer important clues about the forces driving its evolution [12, 57–59]. In this study, we detected some positive selective signals in the tropical clade, but sites under positive selection are quite rare and mainly detected in the ycf1 and ycf2 genes. This may be because adaptive modifications to other abiotic stresses targeting genes in the nucleus were sufficient to maintain homeostasis for photosynthesis since there are a variety of strategies for plants to adapt to the environment, so there is no need for adaptive evolution of chloroplast-encoded genes [60, 61]. The chloroplast NAD(P)H-dehydrogenase-like (NDH) complex is located in the thylakoid membrane and plays an important role in mediating photosystem I cyclic electron transport (PSI-CET) and facilitating chlororespiration [62, 63]. Loss of the cp-ndh genes is widely reported in heterotrophic species because they do not need to synthesize organic carbon through photosynthesis by themselves [10, 11, 13, 64, 65]. However, as more plastid genomes have been sequenced, some autotrophic plants, such as some species of Pinales, Geraniaceae and Orchidaceae, have also been reported to lose almost the entire set of cp-ndh genes [66–70]. In our study, we also found that all of the cp-ndh genes were truncated or pseudogenized in the Holcoglossum plastid genome. The loss of plastome genes may be due to transfer to the nucleus, substitution of a nuclear encoded mitochondrial targeted gene or substitution of a nuclear gene for a plastid gene. Translocation of ndh genes to the chondriome in Cymbidium has been reported, and different levels of ndh gene degradation among even closely related species in Cymbidium may be due to multiple bidirectional intracellular gene transfers between two organellar genomes . As there is an alternative PSI cyclic electron transport pathway: the proton gradient regulation 5 (PGR5)/PGR5-like photosynthetic phenotype 1 (PGRL1)-dependent antimycin A-sensitive pathway [72–74], especially under high light conditions, the NDH1 pathway would be minor, while the PGR5 pathway would be dominant [63, 75]. The NDH complex may not be necessary for some plants. 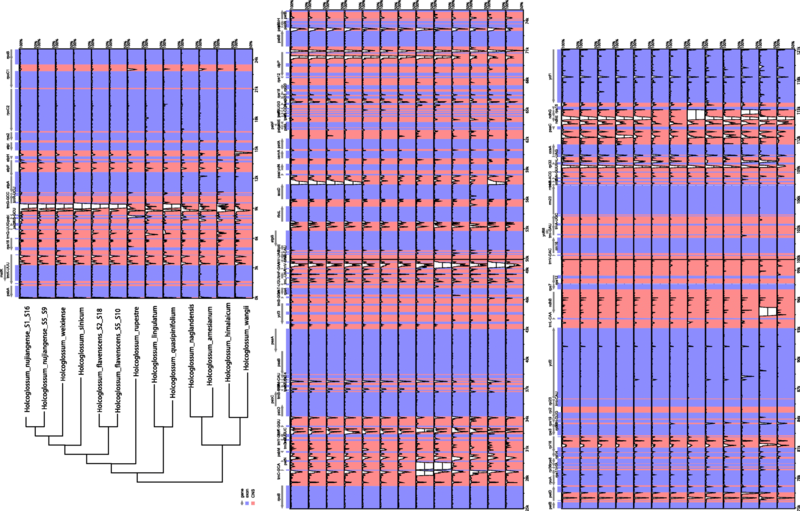 Using comparative genome analyses, Lin et al. found that nuclear NDH-related genes are also lost in orchids without cp-ndh genes . In this study, we reported 15 completed plastid genomes using Illumina sequencing technology via a reference-guided assembly. These plastid genomes were highly conserved, and the whole set of ndh-gene families was truncated or pseudogenized. The five mutation hotspot regions were identified across the Holcoglossum plastid genomes, which could serve as potential markers for phylogenetic and population genetic studies. We further investigated the intraspecific variation of indels and substitutions in two species, and potentially diagnostic variations have been found in the plastomes of different individuals. A hairpin inversion in the coding region of the plastid gene ycf2, which occurred randomly in Orchidaceae, was found in this study. We additionally found evidence that the tandem repeat sequences contribute to the evolution of the plastid genome not only in the intergenic region but also in the coding region. We would like to thank Yan-Lei Feng for helping in plastid genome assembly, Yi-Zhen Sun for DNA sequencing, and American Journal Experts for language editing. This study was financially supported by Strategic Priority Research Program, Chinese Academy of Sciences (XDA19050201), National Natural Science Foundation of China (31670194, 31470299, 41672018), Southeast Asia Biodiversity Research Institute, Chinese Academy of Sciences (Y4ZK111B01 to X.H.J). All annotated plastid genomes generated in this study have been submitted to NCBI with accession of MK442924 - MK442937, MK460222. X.H.J designed the study. X. M, Z.H.L, Y.X.L and C.W.W performed the experiments. X. M and Z.H.L assembled the plastid genome. Z.H.L and X. M analysed the data. X.H.J, Z.H.L and D.Y.W wrote the initial manuscript. All authors contributed to and approved the final version.